Posted on December 7, 2017 at 10:04 am. If you want to make the most out of the weekend, head to Mucho Vegas online casino and claim the 30 percent match deposit bonus on Friday. Simply play online casino games like blackjack and you can boost your bankroll with a match deposit offer. Players can claim the 30% bonus up to €/$300 every Friday at Mucho Vegas when making a real money deposit, provided you meet the terms and conditions. 1. Create an account with Mucho Vegas online casino – it only takes a few minutes to enter your details and sign up. 2. Head to the cashier and make a deposit – there are several payment options to choose from, including global and local options. 3. Make a deposit of at least €/$25 on Friday and select the bonus – the match deposit bonus will not be credited to player’s who do not indicate that they want it. 4. Confirm the transaction and get playing real money casino games. 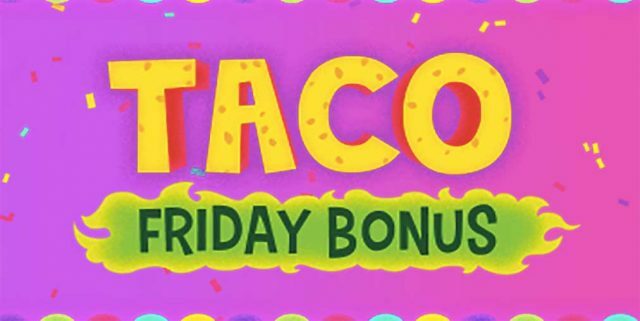 You will then need to wager both your deposit and the match deposit bonus 30 times before you can make a withdrawal, and you cannot receive any other offer while claiming the Friday Taco Bonus. You cannot clear the wagering requirements by playing Castle Builder II, Scrooge, Devil’s Delight, Bloodsuckers, Kings of Chicago, Lucky3, Pirates Gold, Retro Reels, Simsalabim, Zombies, Lucky Swing, Space Traveller, Trucker’s Heaven, Crazy Jungle, Diamonds are forever, The Angler, or Gold Train. You can play these once you have cleared the bonus, however. To start, make your way to Mucho Vegas and boost your bankroll when playing real money casino games online. What if I can’t play at Mucho Vegas Casino? Please note that players from the United States and its various territories, the UK, Canada, France, Italy, Slovenia, Czech Republic, Spain, Switzerland, Netherlands, Malta, Panama, Costa Rica, and Curacao cannot create an account at Mucho Vegas and are unfortunately unable to participate in this promotion. If you are from one of these restricted regions, we also recommend several other casino sites with similar promotions that accept players from your country – Raging Bull Casino is our current top pick.